Perfect for friends and family to spend a few days or a whole season. We have condos on floors two through six that will accommodate up to four guests each. All our condos have private lanais where you can sit and observe the Atlantic Ocean, beach activities, and view the city. You can walk the beach to restaurants, shopping, and entertainment. Following the day's activities, while the kids amuse themselves in the arcade the adults can relax and enjoy our spacious lobby to plan the night's events. On site, we have Jack McCormack's Pub where you can feast indoors or out observing the beachcombers and swimmers, as well as the Blue waters and Waves of the Atlantic Ocean, that is just steps away. Jack also has a tiki bar over looking the beach, pool, and Heated Jacuzzi, as well as an eight-hole miniature golf course. Adults never have to leave the hotel they can enjoy the company of other guest and entertainment at Jack's and then arise to a breakfast on the beach. 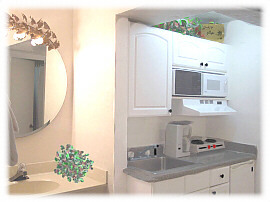 microwave; cooking-eating utensils; cooking condiments, and kitchen linens. blowing through your hair; and alas the beautiful sunset. Outside parking next to building. machines; shared coin laundry; parking; security cameras in & out. Phone: Free local calls; data port for local numbers only. laws enforced, no pets allowed in common areas (this includes pool area). Pets must be hand carried to grassy area, and poop MUST be scooped. Convent Store: Across from hotel. Public Transportation runs 24 hours a day: To and from airport $10.00-$13.00 one-way. Please confine smocking to the lanai, lobby, or out of doors. Rates vary depending on time of year & special events. Summer Discount Rates. Non-event rates start at $55/night. Add 11.5% Sales & Tourist Tax. 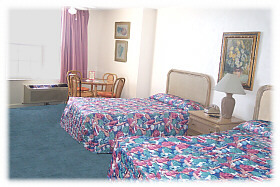 Special Discount Rates for 3+ rooms or stays greater than 2 weeks. Call for rate quotes for stays of 1 month or longer.